[UPDATE]: You can now listen to Mr. Takei's interview on TBS Radio's program "Inside Out," here on their program podcast. Here is the link. Last week Thursday, I was going into the TBS Radio studio for a weekly segment, and as I came out of the elevator, an entourage poured out of an adjoining recording studio. A somewhat older Asian man walked past me, and then I did a double take, and may have murmured "oh myyyy" under my breath. I had just accidentally nearly bumped into the one and only George Takei, known for playing Sulu in the original Star Trek television series, and more recently for balancing humor with social consciousness better than anyone else on social media. You should follow him on Facebook. Even if you don't, you probably actually do without realizing it, because that hilarious image or video your friend put on their facebook wall has about a 20% chance of having been re-posted from his FB page. 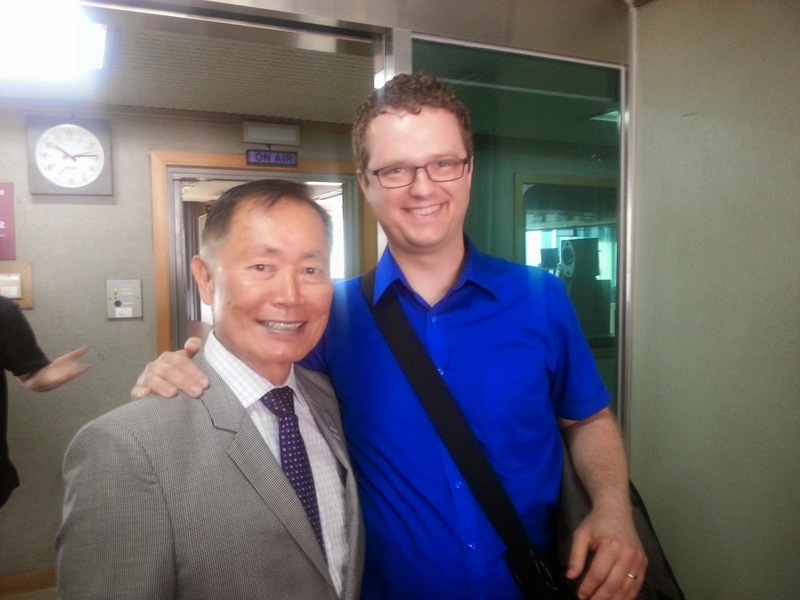 Mr. Takei came to Seoul to promote the play "Allegiance" - a Broadway show about the Japanese Internment Camps that USA ran during World War II, and where Mr. Takei was imprisoned when he was young. He is also holding talks and meetings around Korea and Japan about LGTB issues, in a tour organized by the US State Department organized the tour. You can learn more at the Korea Times. Walter Foreman had just finished interviewing him when I bumped into him, and was kind enough to introduce me to Mr. Takei and snap this picture. Probably my favorite "Rob With A Celebrity" picture. Our encounter was quite brief - he was on his way to the elevator, but he was very nice, and I almost didn't say anything dumb. However, I am sorry to say that in the three days since both shaking Mr. Takei's hand and squeezing his shoulder, I have not developed any magic powers, my jokes are not intrinsically funnier, my phrases have not started turning more beautifully, and my voice has not deepened in the slightest. Maybe I should have done a selfie. The WSJ blog mentions Christian lobby groups who have a bit of history: Here is Human Rights Watch's write-up about the re-wording of the anti-discrimination bill, putting the finger squarely on Christian lobbyists. Christian lobbyists also got a 2012 Lady Gaga concert slapped with an 18+ age restriction (protesters in Indonesia got her concert there cancelled entirely). Personally, I feel that every time Christians take the side that is against loving a group of people that's marginalized, they're missing the point of their faith, and showing an ignorance of how Christ actually lived his life. If you disagree with me that the main purpose of faith is about learning how to love people, and to improve ourselves and become more human through the love we practice, well we're probably not going to see eye to eye. The state of Queer Korea is still very much a work in progress, unfortunately. Things have come a long way since the early 2000s, when even open-minded sophisticates would sometimes tell you there were no gays in Korea... but the disappointing 2007 anti-discrimination bill, and the fact it seems people can still get their ears bent by the anti-gay lobby, is disappointing. You can read more about changing public opinion on gays here, also at Korea Real Time. 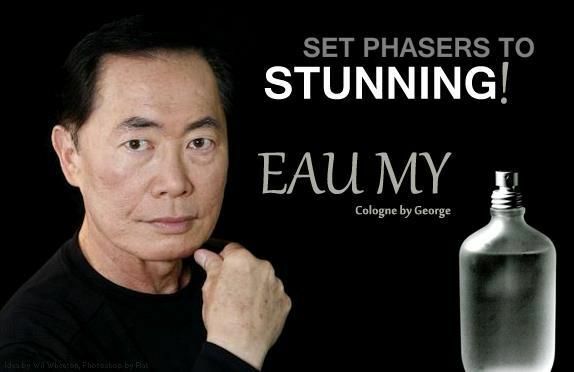 If Mr. Takei takes some time to talk about this, well, that'd be swell. I wrote about the "It Gets Better" project - a beautiful movement against anti-gay bullying - in 2010. Queer Korea is slowly slowly getting more "out," and I certainly hope that society here in general, as is happening in other places (at dreadfully uneven speeds), eventually comes around to the position that people can love whomever they want, dress however they want, and perform whichever gender role they want, as proudly or discreetly as they choose, and those around them should pretty much mind their own damn business and respect their choices. We're not there yet, but we're slowly getting closer. So head out to the pride parade on the 7th. Here's the info. Show support and solidarity, no matter which way you personally swing, dress, present, and so forth.